Heard in Splatoon Enter the Octobot King! — Cap'n Cuttlefish after hearing the Calamari Inkantation in Enter the Octobot King!. The Calamari Inkantation is a song most famously performed by the Squid Sisters. Calamari Inkantation is primarily an electronic-style song, showing musical similarities to J-Pop. In-game, the Squid Sisters' version is actually a cover of the chorus of Calamari County. 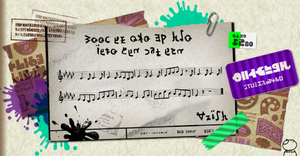 The song is shown to have major in-game significance, as the melody is described as being etched into Inklings' and Octolings' DNA, and listening to the song causes powerful effects, from heightened strength to curing brainwashing. It is first played during Enter the Octobot King!. At the beginning of the fifth and final phase, the Squid Sisters, as Agents 1 and 2, override DJ Octavio's I Am Octavio to play Calamari Inkantation, which gives Cap'n Cuttlefish the strength to break free of his restraints and dance, while Agent 3 continues on and defeats Octavio, who also dances with the music. It can also be heard in Squid Beatz after hearing it in the final battle. Using either the Callie or Marie amiibo also allows the player to watch the Squid Sisters perform the song as if they were in a Splatfest. In Splatoon 2, it is shown that Octolings hearing the Calamari Inkantation are freed of their brainwashing and defect from the Octarian forces. Sunken Scroll 2 reveals that the final battle of Splatoon was somehow interpreted as an underground music show, and Marina can be seen enjoying the song. During the Octo Expansion, Cap'n Cuttlefish notes that Agent 8 was humming the Inkantation whilst unconscious, causing him to abandon his attack out of respect and help the Agent, as a fellow fan of the Inkantation. In Marina's chat room, Cuttlefish researches Marina's past as an Octarian combat engineer, whose files show that she went missing from the Octarian army after listening to the song. Marina later confirms that her and Agent 8's "souls have been freed, there's no way we can continue to live under the oppression of Octarian society" after hearing the song. Later, Pearl notes the many Octolings beginning to populate Inkopolis Square who also listened to the song. The song also appears in Super Smash Bros. Ultimate, and has a chance of playing on the Moray Towers stage. It is also one of the songs that can play when the Squid Sisters Assist Trophy is in use, along with Ink Me Up, and plays when fighting the final boss in Classic Mode as Inkling. It can also be heard in the Sounds section in the Vault menu. The booklet included with Splatune gives the official lyrics for Calamari Inkantation. The lyrics are nonsensical; the Japanese hiragana simply gives the pronunciation. The twenty-third Sunken Scroll, depicting the melody of notes that make up the Calamari Inkantation. The Chorus of Calamari County, also referred to as the Calamari Shanty in the European release of Splatoon, is a folk rendition of the song, with few instruments used. It is meant to depict a recording of various Inklings singing along together, presumably by the beach. The beginning and end include ambient noise of Inklings talking and waves splashing nearby. In-game, this version is not actually a remix, but rather the original version before the Squid Sisters made their cover. However, the ambience suggests that the chorus is not the original song either, as the song could be so old and traditional that no original recording exists, similar to various real-life traditional songs. Although it is only mentioned in the game through the 23rd Sunken Scroll, this version of the song is not actually heard in Splatoon. Instead, it was first heard in Splatune, and was also used in a promotional video, depicting the young Squid Sisters in their kimono outfits dancing to this track using artwork found in Splatune. However, most of the ambient intro and outro was cut. In Splatoon 2, the song can be heard playing in the background in Skipper Pavilion, but is only noticeable during Recon, where no other music is present. This is the song that the Squid Sisters performed at the first Inkopolis Annual Youth Folk-Singing Contest, and the booklet in Splatune revealed that they caught the eye of committee member "Shy-Ho-Shy" due to their performance of the song, and helped them arrive in Inkopolis. It is possible that the recorded song is meant to depict a recording of Callie and Marie's winning performance, backed up by its use in the aforementioned promotional video. However, multiple voices other than the Squid Sisters can be heard in the recording, possibly discrediting this idea. A new version was created for use in Splatoon 2's single-player campaign. This remix remains very similar to the original, yet has additional electronic-style production. It also has a different intro from the original, more akin to the gradual build-up intro from the live versions. The melody of City of Color's chorus can be heard after the end of the chorus of Spicy Calamari Inkantation during the small instrumental break. In a similar vein to how the Calamari Inkantation played during the final phase of Splatoon's final boss, the same occurs during Tide Goes Out. At the beginning of phase 4 of the fight, Callie starts to regain control of herself after Marie's blast from her Hero Charger. Marie pulls out a jukebox and starts playing this remix to try and aid the process. This works, causing Callie to transform back into her original self. The reunited Squid Sisters then perform the song together on Sheldon's flying truck while Agent 4 finishes defeating DJ Octavio. After hearing it in-game, the player can listen to the remix as they please in Squid Beatz 2, with a maximum score of 293 and 544 in Normal and Hard modes, respectively. To promote the first Splatfest, Cats vs. Dogs, a video was released, with Calamari Inkantation playing. It is mostly similar, however, it has a different intro; the original has radio static in its intro, representing the hijacking of DJ Octavio's set, while this version lacks that, showing what the regular version of the song sounds like. Callie also begins the song by shouting out something in Inkling, to a quick round of applause, a similar round of applause is used to finish the song. During live Squid Sisters concerts, an extended version of Calamari Inkantation is used. Although each performance is different due to the live bands, they retain the same strong structure. They all include parts of the song not found in the original, mainly guitar solos in roughly the first and third quarters of the song. A new intro is included, featuring a more gradual build-up with guitars, rather than the "hijacking" intro of the original, and it also has a proper outro. Two recordings of this version from their first and second live concerts can be found in Splatoon Live in Makuhari. During the second half of the final Splatfest in Splatoon of Callie vs. Marie, the battle music changed from the regular music of Ink Me Up to Calamari Inkantation. This version is almost identical to the original version, but the intro is modified to be much shorter, lasting only one second so it can fit better in the countdown. The intro starts as the screen says Ready... and the Squid Sisters start singing as soon as the screen says 'Go!'. Like Ink Me Up, Callie or Marie can be heard hyping up a crowd during battles. These voice clips played either at 2:44 or 1:51 in a match. During Live Performances with Off the Hook and the Squid Sisters, an extended version of Spicy Calamari Inkantation is used. Although each performance is different due to the live bands, they retain the same strong structure. It has an extended intro which is roughly twice as long as the regular version, with only the drums playing initially before being repeated with additional production added. At another point, they stop singing to repeatedly chant "hey!". Soon after, during the C-section, the two talk to the crowd before carrying on with the song with a drum solo playing as they sing. The City of Color melody is also heard once again in the background, more subtly this time, and it also has a proper outro, not heard anywhere else. A recording of this version from Haikaraibu at Tokaigi 2018 can be found in Octotune. When starting the Octo Expansion, the Calamari Inkantation plays during the introduction. It remains mostly the same, but is much shorter, lasting only twenty seconds. An effect is used to make this version sound much more distant, playing into the idea that Agent 8 is recalling the song. The song eventually crescendos, while an echo effect is gradually increased as well before the song abruptly finishes and Agent 8 wakes up to an aggressive Cap'n Cuttlefish, who notes that they were humming the Inkantation while unconscious. During the Escape Phase of the Octo Expansion, if the skip charge is filled up 100% from being splatted too many times, a modified version of the intro of the Calamari Inkantation is played. It has a very noticeable echo effect and is sped up much faster. While battling Inner Agent 3, Calamari Inkantation plays. This version is almost identical to the standard version. However, there is a very subtle reverb effect to the vocals, possibly to signify that it is a memory. It also has the same intro as the Splatfest Incoming! version of the song, now without the applause and Callie's shout at the beginning. If one listens carefully, the train that stops at the station behind Inkopolis Plaza plays a jingle that uses the melody of the Calamari Inkantation. This is possibly meant to be the indicator of the doors closing. This jingle references the Japanese rail system's "departure melodies" (発車メロディ, hassha merodī) that play before a train departs a melody's respective station. This jingle can also be heard in Splatoon 2 right before the Tutorial begins. The aforementioned train jingle can also be heard in the track that plays during the cutscene right after the Tutorial in Splatoon is finished. Although this song is a cover of another Squid Sisters song, City of Color, Maritime Memory also interpolates the melody from Calamari Inkantation. The melody of Calamari Inkantation can be heard in the background at one point in Fresh Start. If one listens carefully at the music that plays in the Deepsea Metro, a few notes of the Calamari Inkantation can be heard, in a very similar fashion to the Inkopolis Plaza Train jingle. 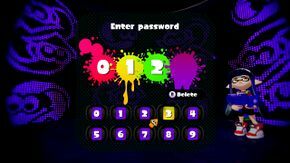 More notes are added as Agent 8 gains access to more lines. After clearing the game, the complete track containing the main melody of the Calamari Inkantation is played. According to a Famitsu interview, Sound Director Minegishi comments that the Calamari Inkantation can be constructed as Agent 8's auditory hallucination, an inner melody of their mind that intensifies as more of their memory returns. After Marie pulls out the jukebox and starts playing Spicy Calamari Inkantation, Marie says "That heavenly melody! ", leading Callie to follow up with "The one and only..." This is a callback to Cap'n Cuttlefish's reaction after hearing the song during the final boss of Splatoon: "That heavenly melody... It's the one and only SQUID SISTERS!" The second half of the TEST PASSED! jingle's note sequence bears a great deal of similarity with a small section of Spicy Calamari Inkantation (heard roughly a minute in), although they slightly differ near the end. With the purchase of DLC, players can play Calamari Inkantation in Daigasso! Band Brothers P. Multiple versions have been released: the original version, a version with vocals, a longer version, and a version based off of the live version. The first two versions were superseded by the longer version and are no longer distributed. Additionally, the traditional version is available exclusively on the lite "Debut" version. On 30 January 2016, a special karaoke version of Calamari Inkantation was added to the JOYSOUND service in Japan, which powers Wii Karaoke U, Karaoke JOYSOUND for Nintendo Switch, and certain karaoke machines. The lyrics are the same as the ones that were in the liner notes of Splatune. It uses the "Splatfest Incoming!" promotional video as the music video for Calamari Inkantation to play in the background. It was also added, with romanized lyrics, to the European catalogue of Wii Karaoke U on 28 July 2016 in celebration of the final Splatfest, however, the European Wii Karaoke U is now discontinued. The calamari in Calamari Inkantation is not only an edible squid, but also a play on the names Callie and Marie, combining to form calamari. The inkantation is referring to the word incantation, which means chant, charm, etc. ↑ Shiokara is a Japanese dish made from fermented squid. The Japanese name for the Squid Sisters is also "シオカラーズ" (Shiokarāzu).